Lakeland, Fla. (January 8, 2014) – Big Cypress Golf Club at Cypress Lakes 55+ Community holds an annual New Year’s Day “Bloody Mary” Open. This year, a cold and rainy day welcomed 2014, but that didn’t hold back our Resident golfers. “Bloody Mary” Open participants collectively contributed over $2,000 to benefit Good Shepherd Hospice in Lakeland. 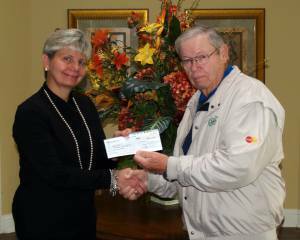 Pictured on left, Cypress Lakes Resident, Bill Hilton presents the “Blood Mary” Open donation check to Stephanie McLean of Good Shepherd Hospice.